Industrial Landscape model are synonimous with huge industrial sheds , buildings and empty spaces and fallow lands for future expansion. These spaces are an excellent source of catchment area for rain water harvesting . 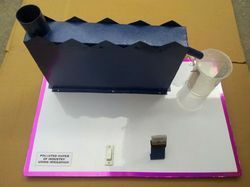 It is model of POLLUTED WATER OF INDUSTRY USING IRRIGATION. It is used in schools to teach children. We are one among the trusted model maker of Land Use Planning Model. Our designers make use of state-of-art technology and latest tools in rendering these reliable and quality land use planning model services. Owing to our rich industrial experience, we are designing Land Scape Models for the clients. These models showcase landscape designs and developments with every details. We design the models representing public spaces as well as buildings with excellence. - Finely made of quality wood, thick iron sheet and coated with durable paints finished with quality adhesives. - Solidly built on a stylish frame support. - Looks like real appearance.